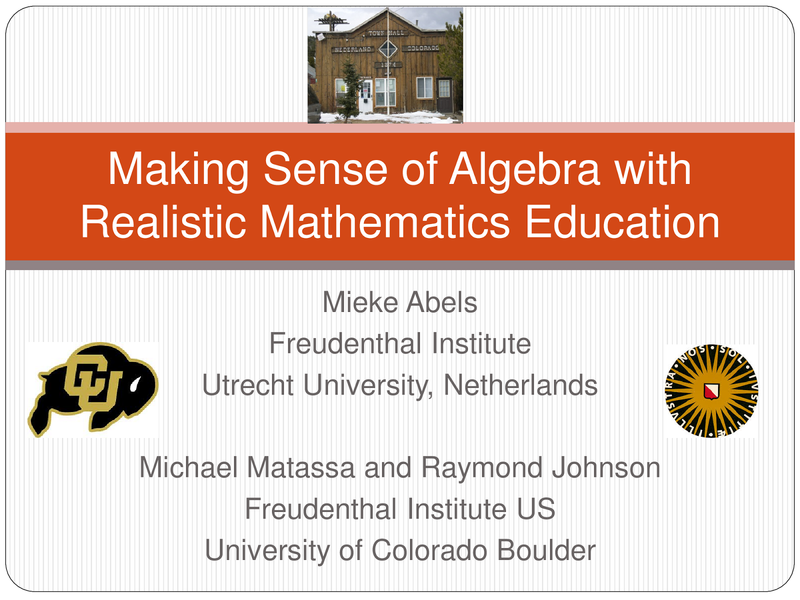 When it came time to propose session for the 2013 NCTM Annual Meeting in nearby Denver, we at the Freudenthal Institute US at CU-Boulder knew we should have some kind of "Intro to RME" workshop. Because I was already proposing to be a lead speaker on another session, I needed to find someone else to take the lead. Michael Matassa said he would do it, but then +David Webb had a better idea: Why not ask Mieke Abels from the Freudenthal Institute to do it? Mieke would be a perfect choice - she's been involved in FIUS from the beginning and she continues to be involved in curriculum development for Mathematics in Context and curriculum in the Netherlands. Happily, Mieke agreed and Michael and I were happy to back her up as co-presenters. 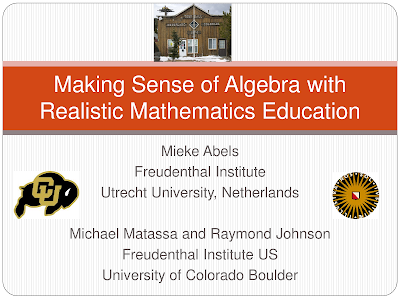 Our goal in this presentation was to bring out the curriculum design features and give attendees a sense for informal and preformal approaches to algebra for the middle grades. Too often it seems "early algebra" gets interpreted as "algebra early," as if a school could just box up their high school algebra textbooks and ship them down to the middle school. Making big jumps to formal mathematics is risky, and that's one reason Realistic Mathematics Education (RME) adheres to a principle called progressive formalization. 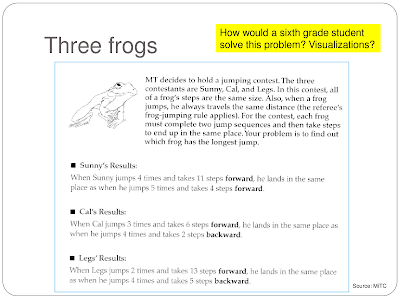 To illustrate, we started with a task you could give to 6th graders, or perhaps even younger students. Those of us who have mastered formal algebra tend to want to write equations for this and solve. But for young students, RME design principles suggest we support students by relying on a "realistic" context. While "real-world" contexts are certainly realistic, RME's use of "realistic" means it can be imagined by the learner. The power of the context is not necessarily its authenticity, but its capacity to be mathematized. 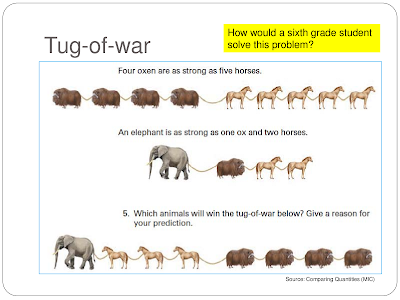 On the tug-of-war task students will inevitably find different ways to substitute different animals for each other until it becomes clear which side would win the tug-of-war. 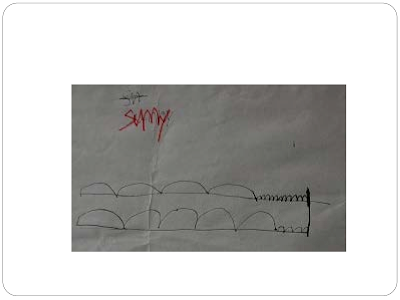 Some students will likely try to redraw the animals, while others might use letters ("E" for elephant, etc.) as a substitute. Even though a formal equation might use "E" to represent the pulling strength of an elephant, it's fully expected at this stage for students to try writing things like "E = O + 2H" to represent the animals in the middle of the above slide, and interpret "2H" simply as the abbreviation "2 horses." 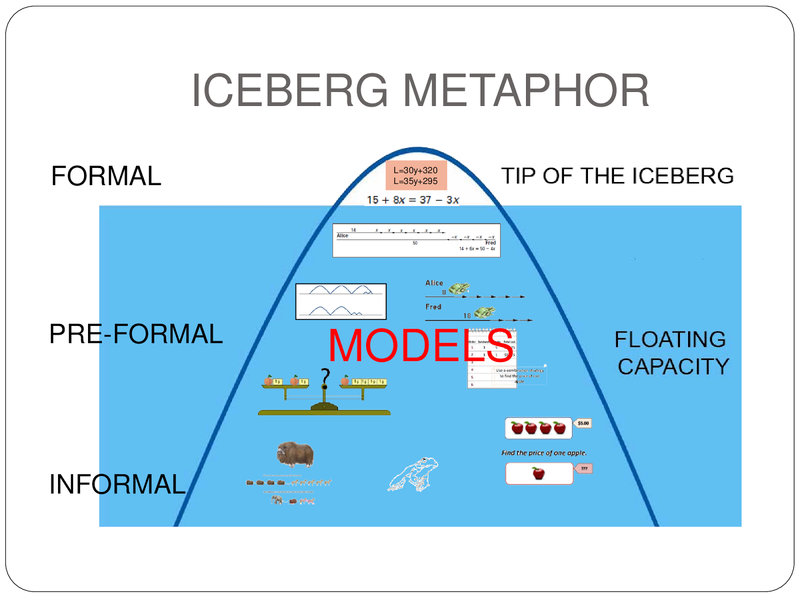 The concept of progressive formalization is often represented with the iceberg metaphor (Boswinkel & Moerlands, 2003; Webb, Boswinkel, & Dekker, 2008), which places formal mathematics above the water line. The tip of the iceberg is only supported because of the iceberg's "floating capacity, which is where informal and preformal mathematics is placed. 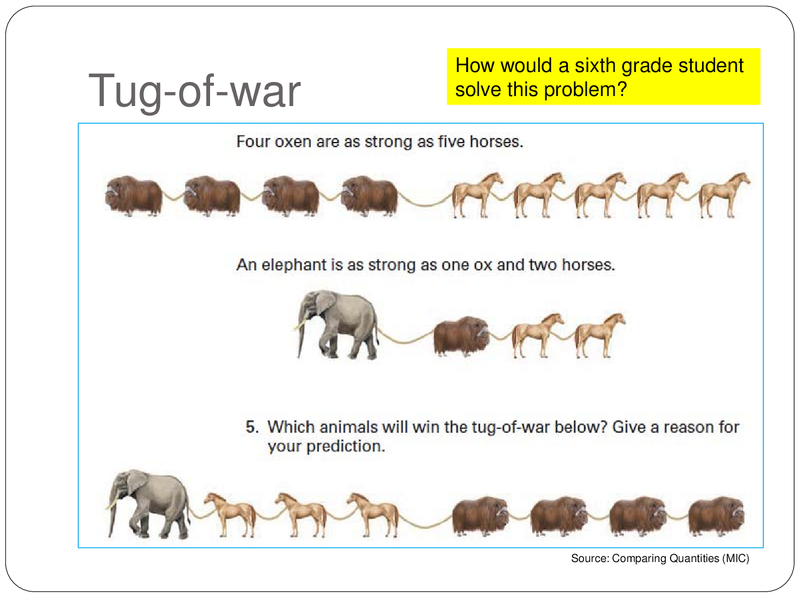 Examples like the tug-of-war problem are informal because they rely almost entirely on the realistic context with little or no mathematical abstraction. Student work for these kinds of tasks can be an indicator of where in the formalization process students might be. If students are redrawing pineapples and lemons, they are still working at an informal level. 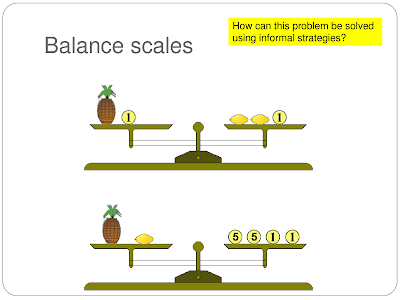 For convenience they might replace pineapples and lemons with letters, suggesting a small amount of formalization, and eventually they'll be using those letters to write equations and not need to think in terms of the fruit and the balance. Just like tug-of-war, the balance model suggests an understanding of equals that is relational, which helps students who tend to interpret equals as operational. 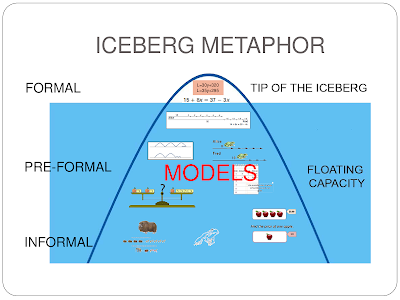 The use of models is at the heart of the preformal level of the iceberg. Nearer the bottom we would place models of informal contexts. For example, a student who draws sectors of a circle to represent a fraction of a pizza is using the circle as a model of the pizza. 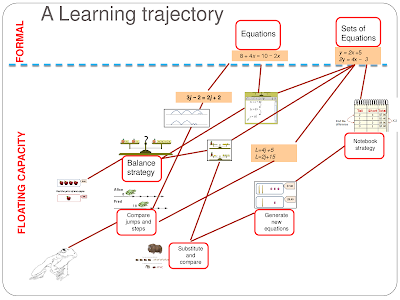 Nearer the top of the preformal level we would place models for mathematical abstraction. The student who uses sectors of a circle to represent a fraction of seats occupied in a bus is using the sectors of the circle as a generalized representation of a part and whole, and not a specific representation of a bus. In RME students become familiar with many models, such as number lines, open number lines, double number lines, ratio tables, five frames, rekenreks, area models, and balance models. 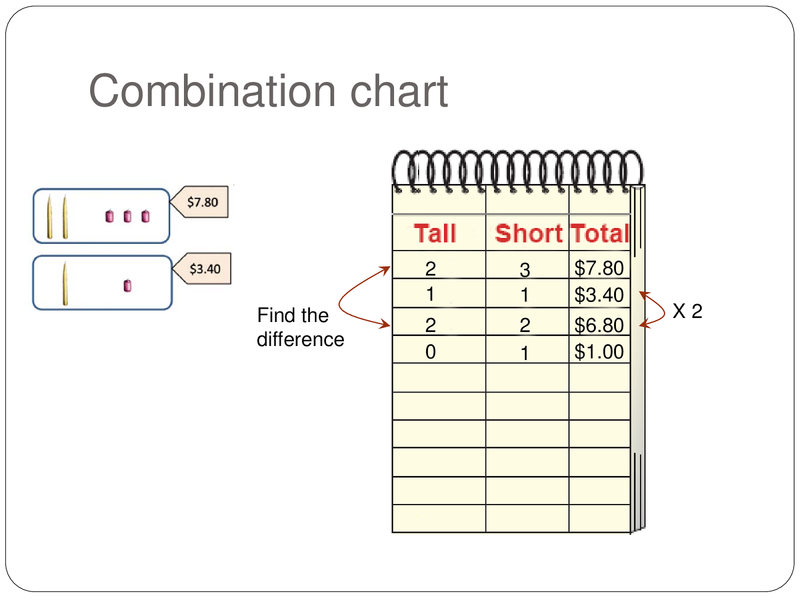 From the notebook it becomes easier to see how students will learn to write and manipulate formal systems of equations. 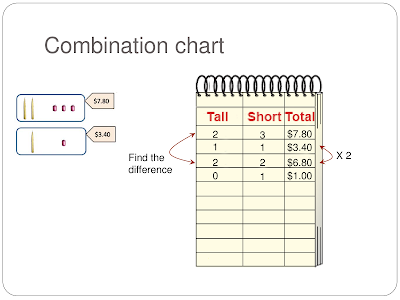 The column headings become the variables, and equal signs are placed in front of the total. Formal matrix notation is reachable from notebook notation as well. Although progressive formalization is often presented as a direct informal-to-preformal-to-formal process, it is not expected that students will learn this way. Students who can work formally or preformally with easier problems are likely to reach to a lower level when problems become more difficult. Because they have achieved the formalization with easier problems, they become more likely to formalize more difficult problems when they can reason with less formal strategies when necessary. 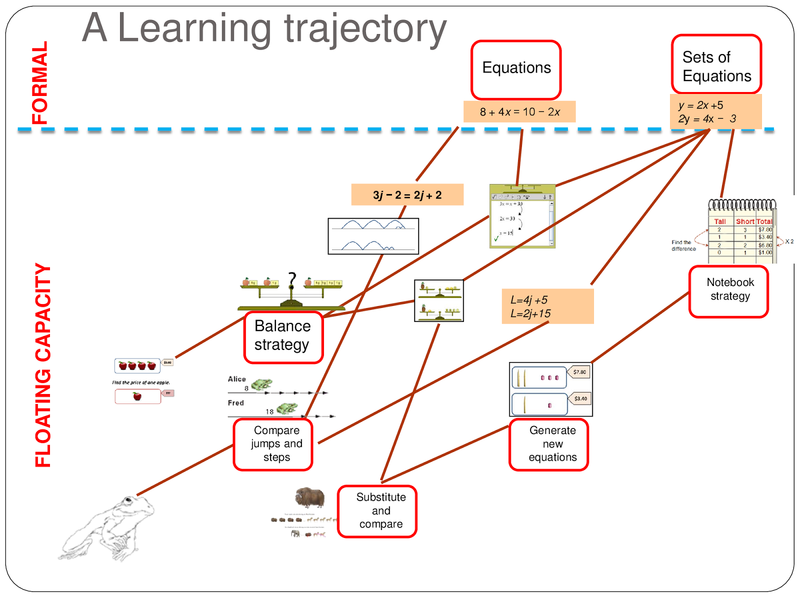 Another way to view progressive formalization is with a learning trajectory, which connects specific contexts and representations along a path towards formal mathematics. Creation of both iceberg models and learning trajectories can be a productive activity for professional development and curriculum planning and alignment. RME isn't meant to be deeply complex, but contexts, models, and the connections between them need to be carefully chosen. Curriculum developers at the Freudenthal Institute take a design research approach to this work, testing and revising in iterative cycles to improve the curriculum over time. FI (formerly IOWO) was founded by Hans Freudenthal in 1971, giving the Netherlands over 40 years to gradually improve their mathematics curriculum and teaching. This type of adherence to a core philosophy for so long is generally unknown in education in the U.S., but schools in the Netherlands have used it to score near the top of international rankings on the mathematics portion of the PISA assessment. 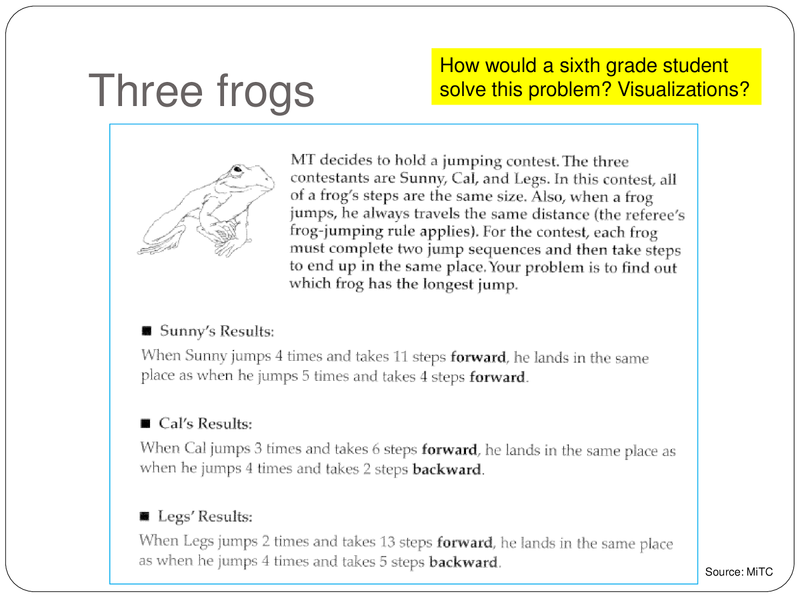 Mathematics in Context (MiC) - units used here were "Comparing Quantities" and "Graphing Equations"
Mathematics in the City (MiTC) - unit used here was "The California Frog-Jumping Contest"
Webb, D. C., Boswinkel, N., & Dekker, T. (2008). 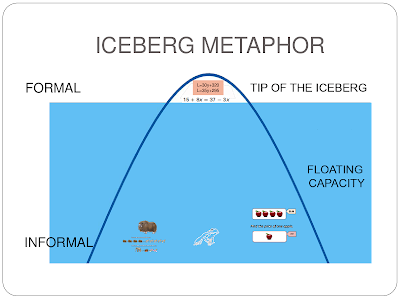 Beneath the tip of the iceberg: Using representations to support student understanding. Mathematics Teaching in the Middle School, 14(2), 110–113. Retrieved from http://www.nctm.org/publications/article.aspx?id=20793.